Full disclosure: this wardrobe simplifying thing is still a work in progress for me. I have clothes in two closets, one dresser, and two under-bed boxes. I still have too many clothes. But I am making progress! I have also done some major cleaning out in the second (guest room) closet. A couple months ago, that was an “open at your own risk” type of closet, the type to open v-e-r-y c-a-r-e-f-u-l-l-y. It was packed to a comical, pile-toppling point. If you came to my house now, you could not only open the closet door, but also safely step inside! The single rack is still full of clothes on hangers (mostly my off season or vintage pieces), but a guest could easily stash a suitcase there. Progress. I’m still learning, and I feel my relationship to my belongings being transformed. Simplifying is a process. If you are interested in simplifying your wardrobe and don’t know where to begin, here are some ideas. 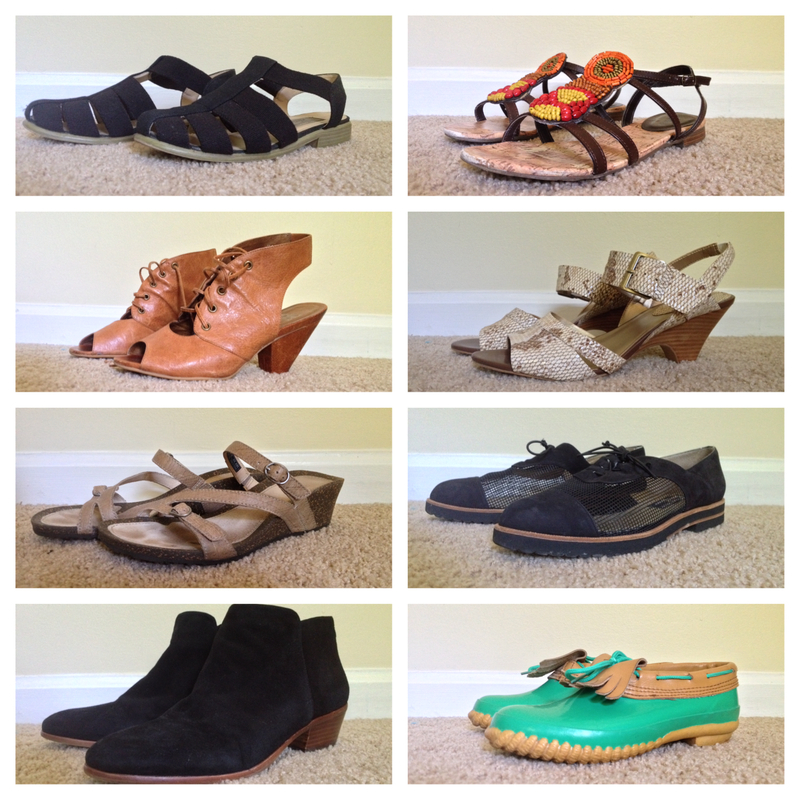 These are things I’ve found helpful in my closet makeover, and perhaps they can get you started on your own journey. 1. 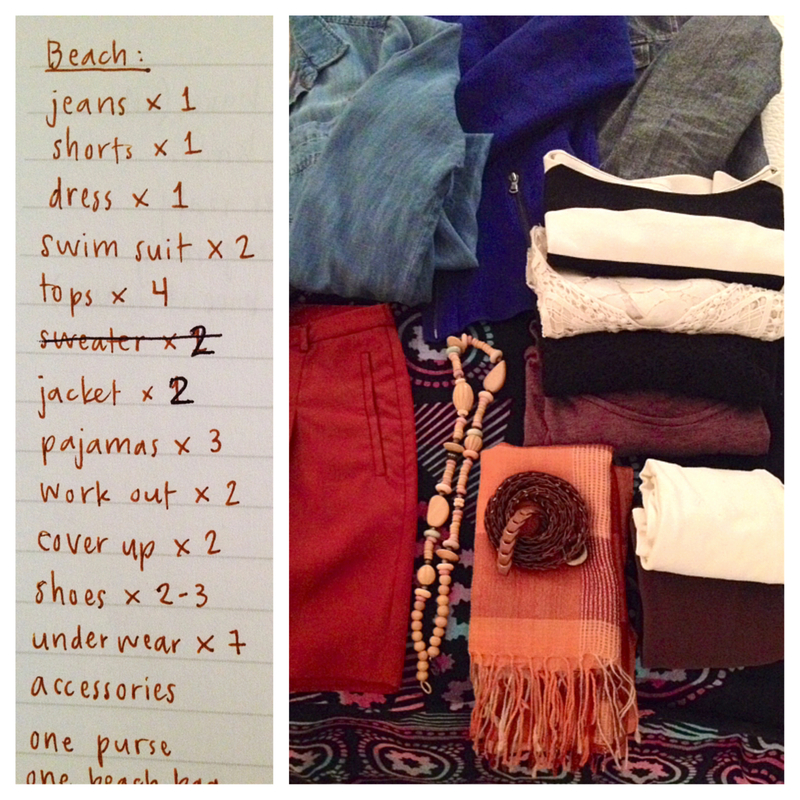 Start the “keep” pile with your favorites and your basics. Begin by setting aside the items you love and wear often, the things you know you want to keep. Sometimes it’s easier to eliminate some clothes once you’ve identified what stays. Also include your wardrobe basics or staples, like your favorite jeans. Note that your basics might not be typical neutrals, like a trench coat or a white oxford shirt. Just because these items appear on many “must have” lists does not mean you must have them! I do have a trench, but in a darker tan that suits me better than classic khaki, and I prefer my blue button down to white, especially since I spend much of my time with a toddler–crisp white and everyday childhood messes do not mix well for me. High-waisted, rust-colored shorts might not be everyone’s basic, but for me they are a staple. They go with all my favorite tops, can be worn with flats or heels, and I even sometimes rock them with tights and a sweater in the fall. I love pattern mixing, and for me, stripes are a basic. I wear my striped tops with just about any and everything. A capsule wardrobe can be black and white and gray, but it certainly doesn’t have to be. Find your own staples, pieces you feel great wearing and can easily combine into outfits. Let these be your signature pieces and form the base of your wardrobe. You may find you have two or three very similar items but generally prefer wearing one of them. When I put my colorful tanks (or my oxford shirts, or my patterned skirts) side by side, I usually have a clear front-runner. The others serve as back ups or extras, and I can free up closet space by keeping the favorites and donating seconds. Now instead of going to my second best when my favorite item is dirty, I just do laundry. It’s slightly less convenient, but I actually feel happier and more comfortable wearing only my top tier clothing. 3. Store out of season and out of size items. If you have the space (under bed storage, an extra drawer or closet space), store things you aren’t currently wearing, or at least move them out of the front of your closet. Since I had a baby two and a half years ago, I finally put those last couple maternity dresses in storage. No need to have these items right in my sight line when I’m dressing each day. The weather has also gotten hot, so under bed boxes and space bags keep my sweaters out of the way and moth-free during the summer. When the seasons change, it feels like a treasure hunt to rediscover what’s been hiding in storage. If space is at a premium, a wardrobe bag in the back of your closet or a box on a high shelf could keep these items out of the way. 4. Remove things that are worn out, stained, or beyond repair. When I examined some of the clothes I wasn’t wearing, particularly former favorites, I discovered that many of them were worn out. It’s hard for me to say goodbye to once beloved clothes, but I am not going to feel good wearing the pilling sweater or the shirt with twisted side seams. If the items cannot be cleaned or repaired, I am better off without them crowding my closet. If you are particularly attached to something that is no longer fit for daily wear, consider whether it could transition to lounge wear. This is the best second life I’ve found for moth-eaten sweaters that I still like but wouldn’t wear out of the house. 5. Find new ways to wear what you have. This won’t get anything out of your closet, but it might grow your appreciation for some things you already have. This is one of my favorite uses for Pinterest, where I keep a secret board of capsule wardrobe inspiration. I included the mustard cropped chinos from my spring capsule in my summer collection, and when I search “mustard pants outfit” or “mustard color combo”, I get lots of new ideas. If you have a piece you’re unsure about or wonder if certain colors work together, search for how others have worn them and find inspiration. You can do a regular internet search as well, but I like how easy it is to collect and store inspiration on Pinterest. Also think about whether some pieces could be worn unconventionally. Two of my dresses also serve as tops when tucked into a skirt or knotted at the waist with a pair of pants. 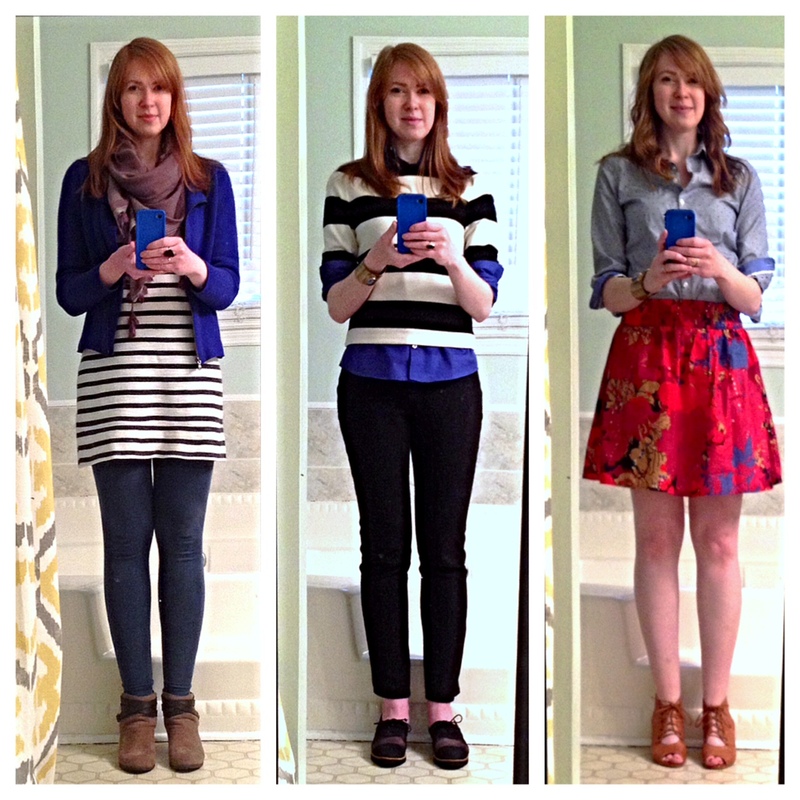 The two outfits on the right, from my late winter/early spring Project 333, show that in action. 6. Discover what you’re actually wearing (and eliminate what you’re not wearing). Try the hanger trick or keep a log (written or photographic), or use an app or online resource to document what you wear for a season. If you are struggling with some of the previous tips, this one might lend some objectivity to the simplifying process. Becoming aware of unworn clothes may make it easier to part with them or could motivate you to make new outfits and transform these items into favorites. Seeing what’s not working can also help with future shopping. Common themes among my unworn clothes included demanding care requirements (dry clean only, etc. ), unflattering styles and colors, or items unsuited for the climate where I live. I now check care labels when I shop, and I limit “hand wash” and “dry clean only” items. I have also avoided buying additional cold climate items like heavy sweaters or lined pants; I live in the Deep South of the United States, and I will rarely have a chance to wear those clothes. 7. Go for a trial separation if you have trouble letting go. Sometimes absence makes the heart grow fonder, and sometimes out of sight is out of mind. And sometimes clichés also apply to clothes. Try stashing clothes about which you are undecided. I kept a pile in that doom closet for a couple months and then reassessed. 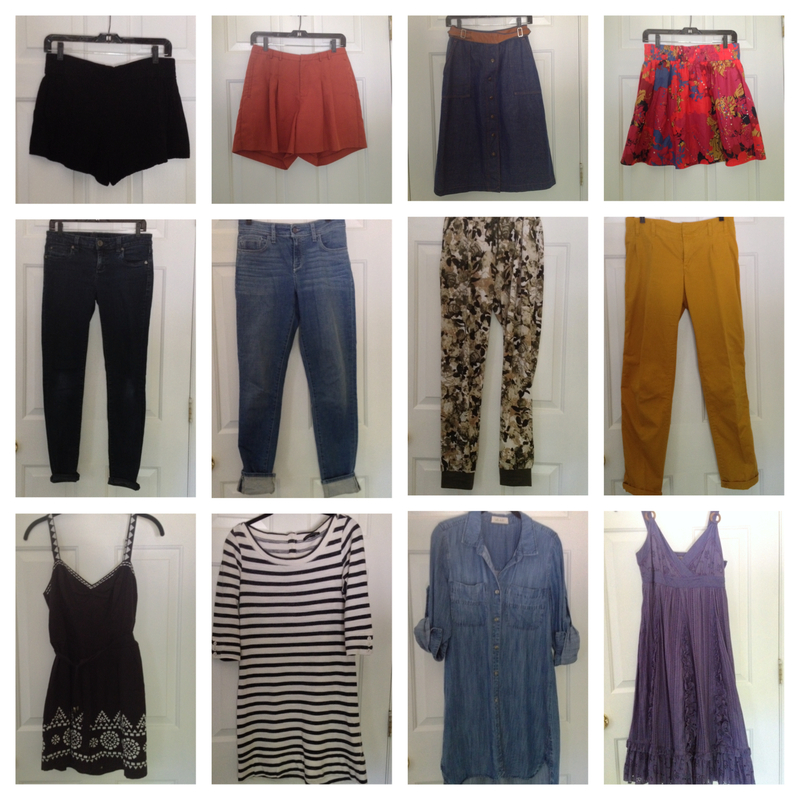 Most of those items have since been donated, but I’m holding on to a few until I make my fall wardrobe. A box or bag in an out of the way place can give you a break from the clothes. If you haven’t accessed the stash or thought about its contents for a specified time (I recommend between one and six months), you might be ready to part ways. You could do this sight unseen or go through items again–whatever works for you. Or you might discover you are more attached to an item than you realized and choose to keep it in your closet. Ready to try it? Let me know how it goes! Have you already cleaned out your closet? What helped you get started? 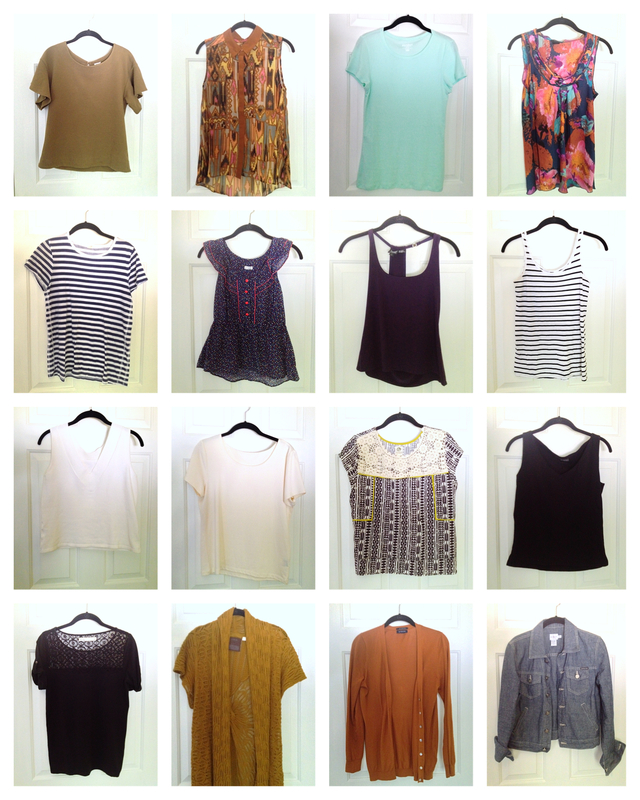 On July 1st, I started a new season of my capsule wardrobe experiment. 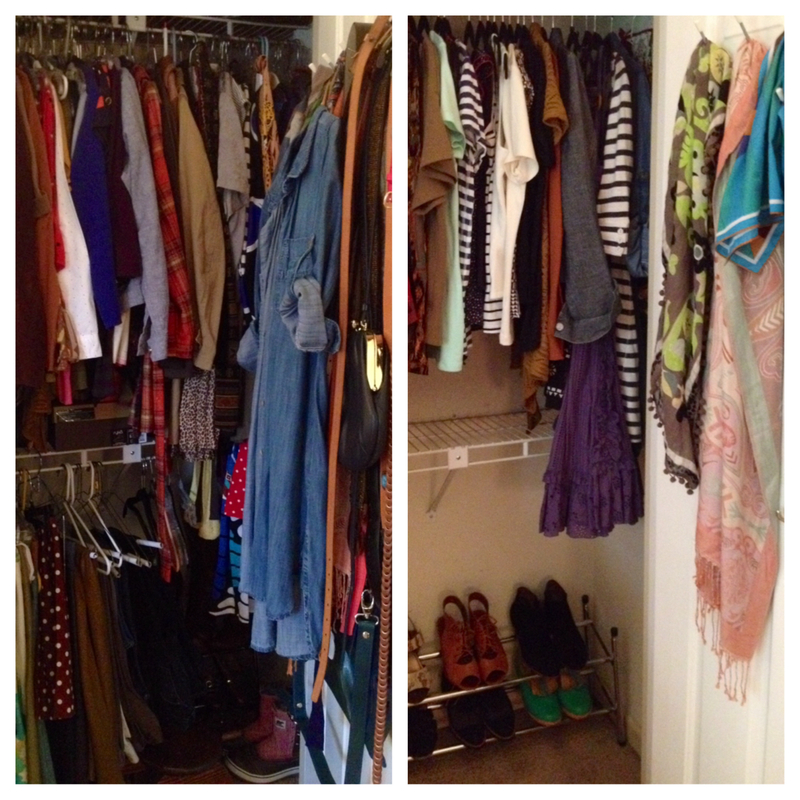 After completing my first round this spring and donating carloads of clothes, my closet and I feel freer. By having fewer things in my closet, I find I actually have more (and better things) to wear. Are you living with a capsule wardrobe or thinking about trying it? I began this project with the suspicion that my constantly growing wardrobe and packed closet were not adding to my life. Wearing only thirty-three items of clothing for a set period of time seemed like a fairly simple way to see if I might enjoy living with less. Turns out I do. In seven weeks, I have not worn the same outfit twice, and I have not grown bored with my options. It almost feels like a game making new outfits from my options, and I find what I’m wearing is more creative and more reflective of who I am. I can confidently say that you do not have to be a minimalist to enjoy a simplified wardrobe. Though I’ve done some online window shopping, I have not added to my wardrobe during these weeks. I’ve even left my “off limits” clothes (those not selected for my thirty-three items) alone, with the exception of making two swaps. I chose not to include shoes and accessories in my count, though I did limit my selection of these items as well. I have had a tougher time sticking to my pared down options here, and I’ve added back some packed away shoes and jewelry. I’ll keep working with those things to find what works for me. Now that Easter is here and Lent is over, I’m setting a new goal to extend the project with my current items through June. I feel like I’ve taking one significant step toward simplifying my life and having my reality more closely reflect my priorities, and I’m looking forward to seeing where this takes me. Anyone else care to join me and give this a try? Where might you benefit from less in your life? Earlier this month, our family went on a week-long beach vacation. I expected my limited closet would make packing especially easy, and I beamed with pride at my great planning and organization. I made a list in advance, picked things that layered well and could be combined into several outfits, and then laid everything out to admire my work. I mean, look at that spread: efficient accessories, options for temperature swings . . . I felt really pleased with myself. And then I started filling the suitcase, which was a standard, rolling carry on. My packed suitcase was thoroughly packed, and I suspected I had packed too much. I pulled a stack of items off the top, removed a pair of shoes, and zipped my luggage easily. None of the items pictured above were among the things removed from the suitcase and left at home. Rather, I had taken out pajamas and lounge clothes. For a week-long beach trip with my family, I had brought about a dozen outfits’ worth of clothes and only one set of pajamas. We also had in-unit laundry, which I used while there but completely ignored while packing. I forgot that reality is reality. I spent half my time in lounge clothes or swim wear, relaxing with my family. A pile of lounge wear doesn’t make a Pinterest-worthy picture, but fewer outfits and more pajamas would have been a better fit. Obviously overpacking for a car trip a few hours away is a mistake of little consequence. Still, I’m trying to cut down on these fashion mistakes and the time, money, and stress that they cost me. My unedited closet contained plenty of mistakes: the mint green tank that was on sale but isn’t the right color for me; the designer skirt that was a great deal but is a size too small and only fits while I’m standing and wearing super-constrictive shapewear; the silk top in the perfect color that must be dry cleaned after every wear. Those three items collectively cost me less than $60, but those are only three mistakes of many. Yes, that’s a large hole. It extends beyond the seam into a long run, and it gapes right around my left hip whenever I wear it. That $60 spent on mistakes could replace my basic tank along with my favorite tights that have a run and can only be worn with boots. I think I would even have enough left over to re-sole a beloved pair of heels and possibly alter my charcoal skirt that’s a bit too big. Not one of those investments has the appeal of buying a new top, even a top in the wrong color. Similarly, packing pajamas sounds far less exciting than packing outfits I will not have an opportunity to wear. I am swept up in the thrill of the new and the idealized, and I end up missing what I actually need. I’m hoping that with greater intention and objectivity, I will make fewer fashion mistakes. I have grace for myself in this learning process, and I know I’m growing in the art of packing and living lightly. 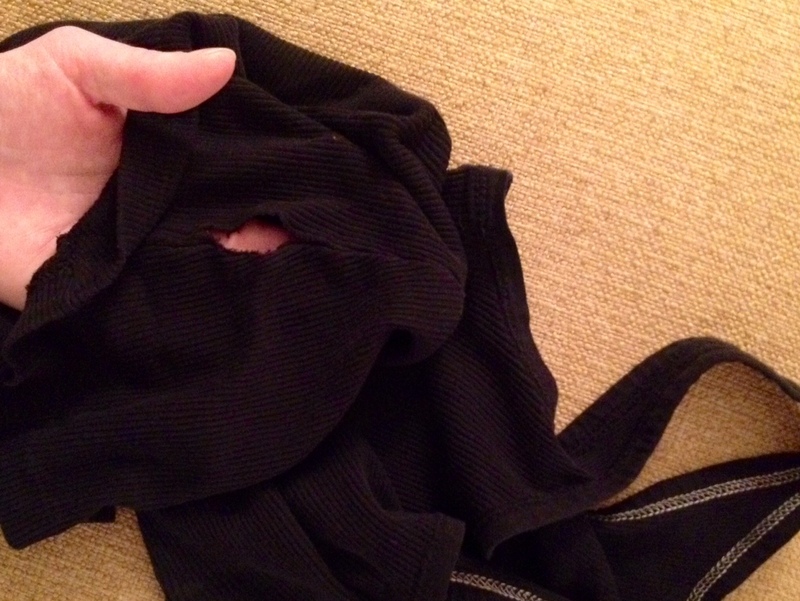 And next time I go shopping, will someone please remind me to replace that hole-y black tank top? 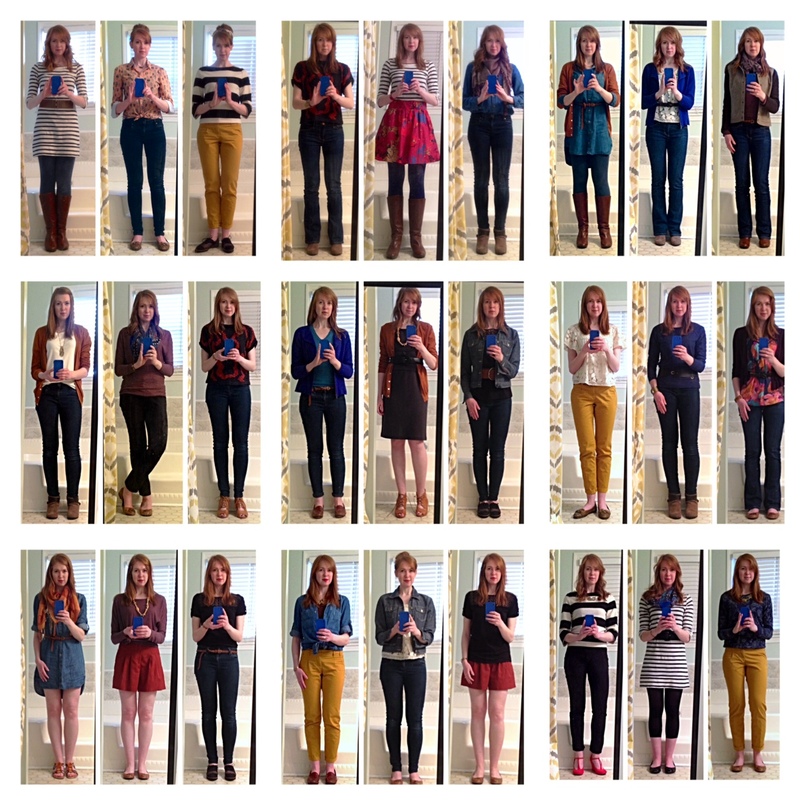 For the past six weeks I have dressed from a thirty-three item wardrobe inspired by Project 333. Though you can start anytime, Project 333 participants generally begin their three month terms to coincide with the seasons (January, April, July, October). 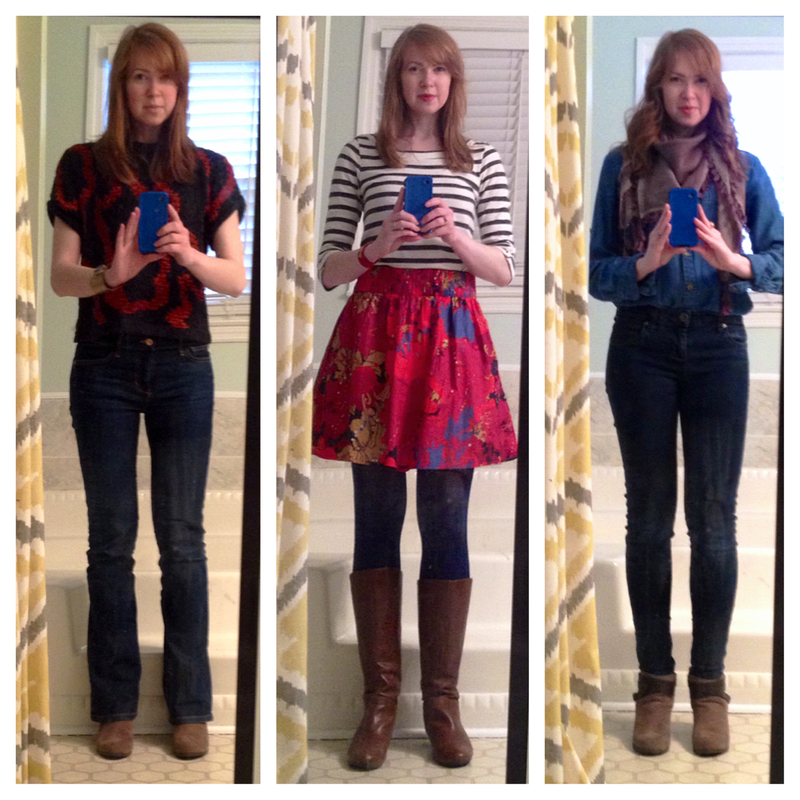 I began in early March along with Lent, and I “gave up” about three quarters of my wardrobe to try living with less. Some of these items have been donated or will be sold, and others are packed away for the season or because I am not yet ready to part with them. While I’ve been engaged in this limited wardrobe experiment, I have recorded my outfits with notes and photographs. I am also keeping a “wear count” because I’m curious about which items I wear frequently. Since I have bridged seasons with my time frame, some items have not yet been worn due to weather (i.e., my linen romper–come on already, Spring! ), and I have swapped out at least one item that was decidedly Winter (a lined brown tweed jacket) for something more Spring-ish (a half sleeve hooded jacket). 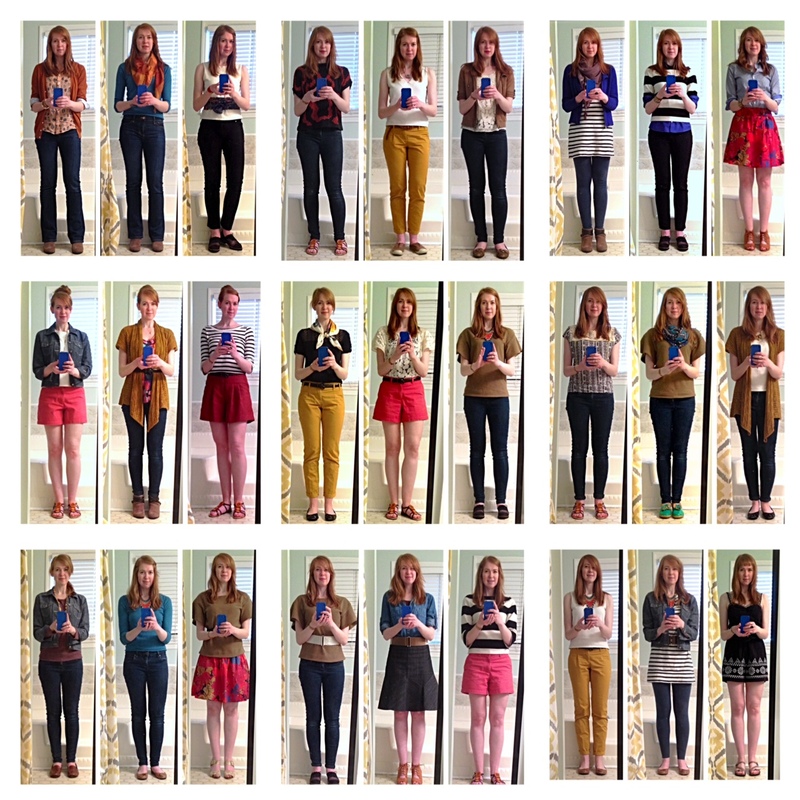 What I’ve found most interesting is that I have not worn the exact same outfit twice. With the twenty-seven clothing items I’ve actually worn, and with an intentionally limited selection of shoes and accessories, I have made a unique outfit every single day. 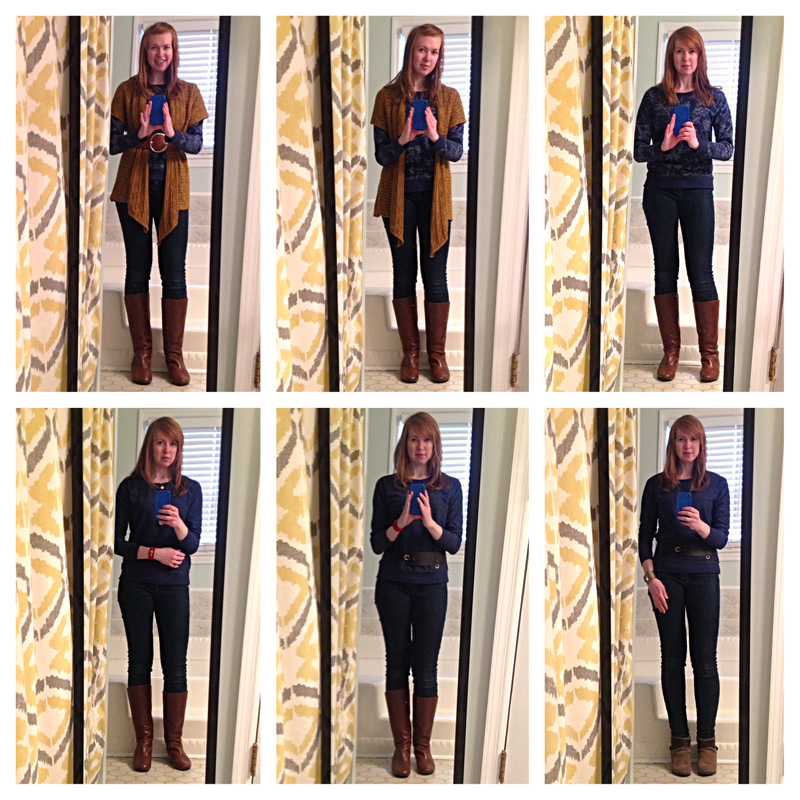 Documenting my outfits has inspired me to find different combinations. I am more self-aware and less self-conscious. I feel like I have a better idea of which shapes and proportions work for my body, and I feel more confident in what I’m wearing. Viewing my style in photographs has given me slight objectivity, and building outfits from a smaller, preferred selection of items is producing better results for me. I guess it’s similar to cooking with the best ingredients available to you; even simple recipes taste delicious when built from quality ingredients.